Chopicalqui Climbing – Climbing Chopicalqui 6,354/(20,850ft) is the fourth highest mountain in the cordillera blanca located between the huascaran sur and contrahierbas mountains Chopicalqui peak has one of the most spectacular summit ridges and summits in all of the Cordillera Blanca. 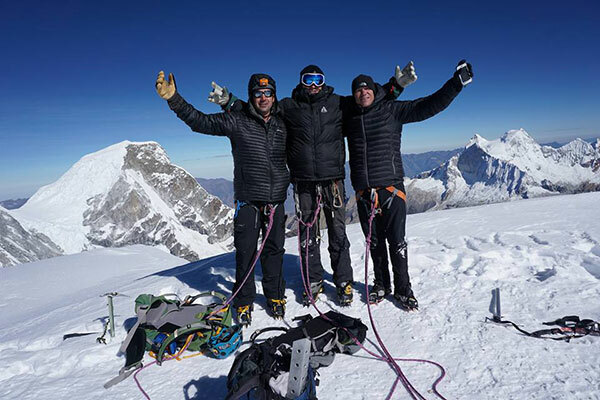 Chopicalqui is a moderately difficult peak to climb, requiring a high camp to be set up at approximately 5, 400m/18,375ft, before the final summit climb early the next morning. 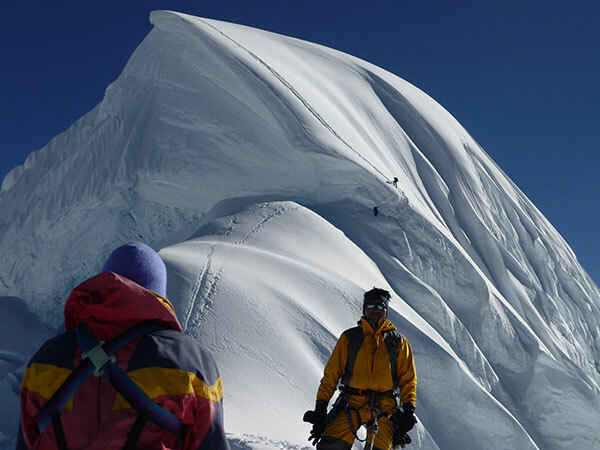 The climb offers spectacular views of neighboring summits Huandoy, Pisco, Chacraraju , Yanapaccha, contrahierbas and Huascaran, and most of the range is visible from the summit. Is necessary to be in good good conditions. Day 1: Huaraz 3,090m. 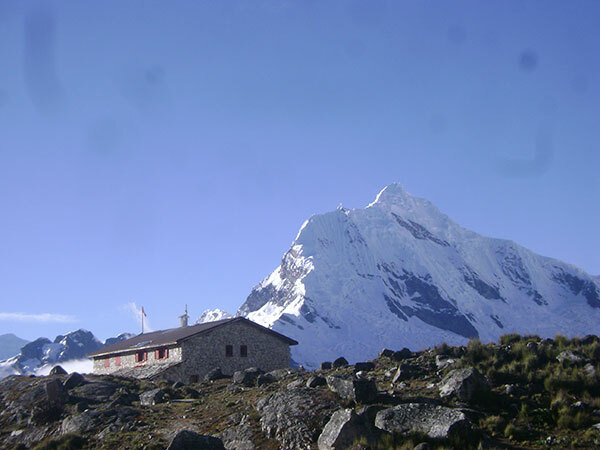 – Langanuco – Base Camp Chopicalqui 4,250m. 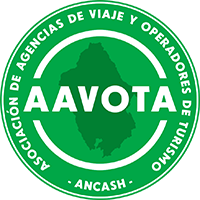 After the breakfast we going to pick up you and drive toward callejon de Huaylas and Llanganuco valley we will takes 3 hours drive and 30 minutes for arrive to Base camp overnight camping. Day 2: Base Camp – Morrena Camp 4,800m. After the breakfast in the camp we will hike up to moraine camp for about 4 hours during this high we will enjoy the next views pisco ,chacraraju and huandoy peaks, overnight camp at 4,800m. After the breakfast in the morning we continue climb up for 50 minutes over the rocks and get the glacier where we going to put our climbing gears and start climb for about 3 hours to high camp, overnight at 5,500m. Early in the morning we will have a breakfast after we leave at 2:00 a.m. climbing for about 5 to 6 hours will get the summit 6,350m. 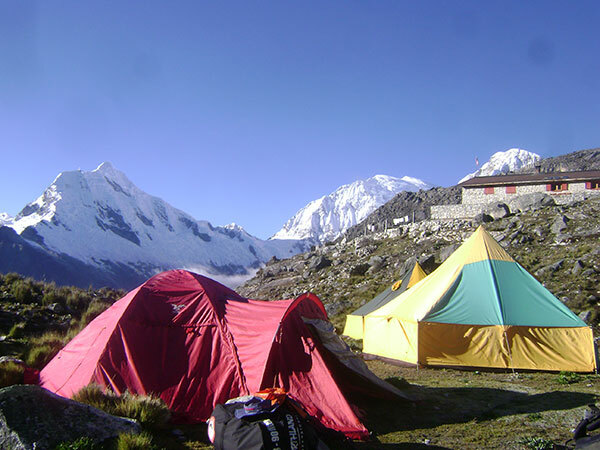 then after enjoy the views for few minutes will came back to Camp I and continue go down to moraine camp and Base camp . After our last breakfast in base camp of Chopicalqui we will descend to highway called curva where our transfer private will be waiting for us, from here to Yungay and Huaraz.